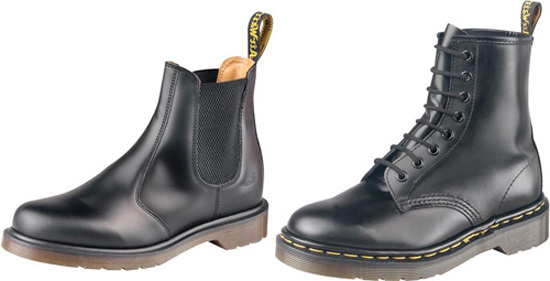 Doc Martens got their start in 1960 and were an instant success. The working class at the time loved them as did the youth and what followed was a growing in popularity from generation to generation that it is still going today. Now it is very common to see Doc Martens on many a shoe rack and because of the many different colors and styles of the shoes it is easier than ever to match them with many different garments to create some unique looking ensembles. • Jeans: This is the old standby. Wearing your favorite pair of Doc Martens with a nice pair of jeans looks great every time. Stay away from the skinny jeans here as wearing them with your Doc Martens will give you the look of having really big feet. Instead opt for a pair that is a bit looser on the fit and that will cover the shoe. You can then add a roll to the bottom of the jeans creating a stylish cuff. Pair this with your favorite shirts and tops and you have a great look. You can further enhance this look with a blazer style jacket or even a lightweight leather jacket. • Skirts and dresses: Wearing skirts with Doc Marten boots may have at one time seemed taboo, but these days it is seen quite often. Start with a black pair of Doc Martens and then put on shorter style skirt that is a loud and bright color and be sure that your shirt is just as bright and loud. You can top off the look by wearing a shorter style leather jacket. For dresses go for the same look as the skirt but go a bit longer in length. Wear dresses that come down to the top of your knees for a more conservative look. • Tights: This is a look that is being made popular by a team of teenage television starts. With this look you need to start with black tights and then wear a different colored mini skirt. Then wear loud and bright colored tops, such as yellow, and pair it all with Doc Martens that are colored to match the top. You can easily accessorize this look with a jacket or even a scarf if you like. • Shorts: This look was made popular in the 80s but seems to be making a comeback. The look starts with black Doc Martens and is finished off with lighter colored shorts and a darker colored short sleeved t-shirt that hangs off of one shoulder. Doc Martens are definitely here to stay and with their versatility they are a must have for your shoe rack.